As a member of the best-selling pop group Spice Girls, Mel C (AKA Sporty Spice) enjoyed her share of musical superstardom. At the band’s peak in the Nineties, the young singer’s signature look featured baggy sweatpants, an assortment of tattoos, a nose stud and a gold-capped incisor, front and center in her mouth. Today, Melanie Chisholm is still singing — but now she’s a mom, an amateur triathlete… and that gold tooth is just a memory. Not only that, her smile looks more evenly spaced and whiter than it did when she was referred to as the “tomboy” of the group. What happened? In our view, it all boils down to changing tastes — plus a little bit of help from dental professionals. As the “wannabe” singer proves, there’s no single standard when it comes to making your teeth look their best. Your own look is unique to you — and your smile can reflect that individuality. For example, crowns (caps) are substantial coverings that may be placed on teeth when they are being restored. They are available in three types: gold, all-porcelain, or porcelain-fused-to-metal. The latter two are tooth-colored, while the gold is — well, shiny like gold bling. Which one is right for you? In many cases, it’s your choice. Likewise, dental veneers — wafer-thin shells that can correct cosmetic issues by covering the surface of your teeth — can be made in a variety of shades. Their hues may range from natural ivory to Hollywood white, and everything in between. What’s the best color for you? Only you can say. Some people opt for a “smile makeover” that uses small irregularities in the spacing and color of teeth to create a more “natural” look. Other folks want a perfectly even, brilliant white smile that dazzles the eye. Still others are looking to match or restore the smile they once had — perhaps even re-creating a signature gap between the teeth. As long as there are no other dental issues involved, the choice is yours. Periodontal (gum) disease causes more than simple gum swelling—this bacterial infection can harm and destroy your teeth’s supporting structures, including the bone. Its aggressiveness sometimes requires equally aggressive treatment. Gum disease usually begins with dental plaque, a thin film of bacteria and food particles on tooth and gum surfaces. Without proper oral hygiene plaque builds up with large populations of bacteria that can trigger an infection. The growth of this disease is often “silent,” meaning it may initially show no symptoms. If it does, it will normally be reddened, swollen and/or bleeding gums, and sometimes pain. A loose tooth is often a late sign the disease has severely damaged the gum ligaments and supporting bone, making tooth loss a distinct possibility. If you’re diagnosed with gum disease, there is one primary treatment strategy—remove all detected plaque and calculus (tartar) from tooth and gum surfaces. This can take several sessions because as the gums begin responding to treatment and are less inflamed, more plaque and calculus may be discovered. 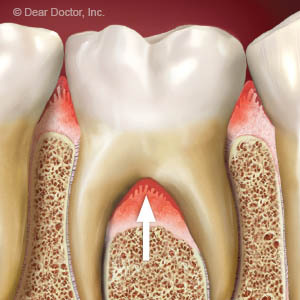 Plaque removal can involve various techniques depending on the depth of the infection within the gums. For surfaces above or just below the gum line, we often use a technique called scaling: manually removing plaque and calculus with specialized instruments called scalers. If the infection has progressed well below the gum line we may also use root planing, a technique for “shaving” plaque from root surfaces. Once infection reaches these deeper levels it’s often difficult to access. Getting to it may require a surgical procedure known as flap surgery. We make incisions in the gums to form what looks like the flap of an envelope. By retracting this “flap” we can then access the root area of the tooth. After thoroughly cleansing the area of infection, we can do regenerative procedures to regain lost attachment. Then we suture the flap of gum tissue back into place. Whatever its stage of development, it’s important to begin treatment of gum disease as soon as it’s detected. The earlier we can arrest its spread, the less likely we’ll need to employ these more invasive procedures. If you see any signs of gum disease as mentioned before, contact us as soon as possible for a full examination.